It was raining and heavy winds buffeted the walls of Knifetooth. Einar Sigurdsson shaked his head. They spent another day in the little garrison town, and Jonlar Zilv spent most of it wasting his money at the Coughing Cur. He was so generous that he gained the trust of a traveller who had been spending his time here, an elf in a flower-patterned green cloak. He was Elandil Hundertwasser, far from the West, “from the blessed forests where the harps sing”. Elandil was here to heal to heal the world’s hurt, and wore the sign of Irlan the Merciful, who taught a doctrine of caring for the weak and the downtrodden out of sheer goodwill. After a short discussion, he joined the company, while Barzig the Nomad – whom neither the late Sufulgor del’Akkad’s player, nor anyone else really liked – returned to sulk among the NPCs and be a nuisance. The next day – the twelfth since the fateful encounter in Haghill – the skies were clear and there was good wind. They set sail back to the northeast, and under Einar’s command, the increasingly well-trained crew worked as if they had always been on the seas. Although their destination was the mysterious ruin at the southern tip of the isle of the wolves, they would stop sooner. Barely half a day has passed when, sailing around the wooded island across Knifetooth, the lookout spotted a manmade structure among the trees – a dome looking like shining marble. 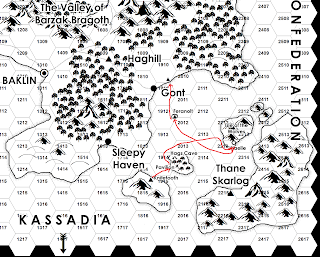 Overcome by curiosity, they ran the dragonship ashore, and as the crew began to gather wood under Einar’s commands, Gadur Yir, Jonlar Zilv, Harmand the Reckless, Elandil Hundertwasser, Barzig the Back and ten men went off to explore the isle’s interior. They followed a narrow and winding path, and at last came to a clearing at the foot of a hill. This seemed to be a nexus of multiple paths, converging on the domed edifice. A circle of columns stood on a half-sunken foundation overgrown with grass, and a broken white marble dome rose over the columns. Approaching the structure, Jonlar Zilv noticed something shimmering between the columns, surrounding the interior – a slight distortion or refraction, barely visible. Inside, something seemed to stir, but it was just a hint of movement – or perhaps another trick of the light. Singing the tunes of “Oh Lucky Day”, he felt the structure was magical. Prodding between the columns with a branch, then a dagger ascertained the way was blocked by something like a firm but invisible wall, and climbing the dome with a rope, it was discovered that the crack in the marble was likewise blocked by the same influence. At least Gadur Yir, who was acting as the lookout, saw something interesting: among the few hills rising from the island’s forests, smoke or steam seemed to issue a short way from here – probably worth investigating. They spent a little more time, fashioning a heavy tree trunk into a makeshift battering ram, but even with their ten followers, the invisible wall did not yield. Now investigating the trail leading in the direction of the vapours, they discovered its source was a crevasse in the hillside. Flanked by enormous ferns, steep rock ledges descended into a dark sinkhole, and they felt the mixed smell of hot steam, salt and charnel rot. “Men! You shall wait here until the evening as we investigate this place. If we do not come out, you shall return to the ship and alert the others,” instructed Harmand as they lit their lights and prepared to descend. The crevasse twisted and turned, and the damp heat increased. From below came the foetid smell, and the sound of a chanting choir exclaiming ominous gibberish. Jonlar signalled the others to wait, and – shielding his lantern to stay undiscovered – tiptoed down below towards a number of dim lights in a larger cavern. He happened upon a hideous scene out of some stygian hell: pools bubbled with sulphurous and salty waters exhaling a fiery heat, and a ring of four dark shapes danced around a black cauldron bubbling with brew. The hooded forms writhed and stalked, croaking vile curses and incantations; behind them stood several motionless figures, man-shaped, wrapped in sackcloth and tied together with chains and ropes. He crept closer to see one of the hooded dancers, and froze – as one of the robed forms faced him, he spotted a hideous, bloated female visage, as if she had been dead for weeks. The black eyes shone like sticky pearls, and the tongue was like a slug in the hag’s abominable mouth. The sight, combined with the smell of putrefying flesh and seaweed, was too much for Jonlar, and he vomited out his lunch. Feeling weak and feverish, he stumbled upwards to the company to report. “Of course we should attack them!” Gadur Yir was resolute, and the others nodded. They prepared to ambush the hags while they were busy with their dance, but as they descended, words of magic echoed in the crevasse and all went black. Under the veil of darkness, they heard shuffling, smelled rotten meat and salty water, and knew that the corpses in sackcloth were upon them. A light spell pushed the darkness back a little, creating a small bubble of illumination where they could fight the faceless horrors, which withstood the heaviest blows and tore terrible wounds with their bare hands. Ripping the cloth revealed dead eyes and decomposing faces, eaten by salt and disfigured by appalling wounds. The dead were massively powerful and very hard to destroy. Nevertheless, Gadur Yir could push through them to attack the hags directly – rushing and felling one of the crones with his sword just as she was reaching for a shelf laden with bottles of strange liquids. Just as he turned, he came face to face with another, whose eyes bore into his. He felt the shadow of death as his throat and lungs began to fill with seawater, but, coughing, he rushed forward to strike – but she was quicker, and as she spoke magical words, he saw a cone of radiant lights hit him, and lost consciousness. “Foul hags! The light of goodness shall burn you! Come up and face your death!” called Elandil. “Come on down yourself, pretty!” came the mocking cry. Finally, the way down was clear, and they rushed to Gadur Yir’s aid. The hags were ready, but this time, so were Harmand and Elandil. Two hold person spells caught the foul women – one of whom was trying to submerge an undressed Gadur Yir into the steaming cauldron – and after a fateful moment while unseen forces were debating whether they were indeed persons or not – two froze before they could work their magic again. A melee developed in the cavern with the remaining undead and one hag. Struggling with a brine-eaten corpse, Jonlar Zilv slipped on the wet rocks, and fell headfirst into one of the boiling salt water pools along with his opponent, but survived, and the opponents were all downed, the hags executed with extreme prejudice. Gadur Yir, finally freed from the spell he was under, quickly donned his armour again. The potion was accompanied by a flask cut from smoky glass, emblazoned with a death’s head, and a bag of dust, also magical. “The black one is very powerful. What could it be used for? Did they use it to transform into these monsters? Something to do with these undead?” Nobody answered Jonlar’s questions. They returned to the expedition, then ordering the men to carry the makeshift battering ram to the ship, headed back towards the seacoast, casting another glance at the domed building. At night, playing music as they feasted on their supplies, Jonlar Zilv tried to remember if he had heard of the enigmatic building. “In its glittering prison, hoar, to rest returned” came the words of an old song. “Maybe early in the morning, when it is coldest,” he thought. At the same time, Gadur Yir built another fire out of sight from the company. Holding up the head of a defeated hag, he offered his deeds to Haldor the Heroic, along with a sacrifice of two hundredweights of gold. There was a rolling sound in the distance, and he heard words that spoke to him and urged him to reach for greatness through mighty deeds. He felt stronger, more in tune with his god, now one of Haldor’s divine champions. Einar ordered the dragonship to sail towards the vessels, which tried to escape but were overtaken. “We are poor fishermen and have no valuables!” pleaded someone on one of the boats. “These people are useless” Harmand grumbled. Another night passed as they slowly navigated around the island’s southern tip, avoiding the treacherous rocks. 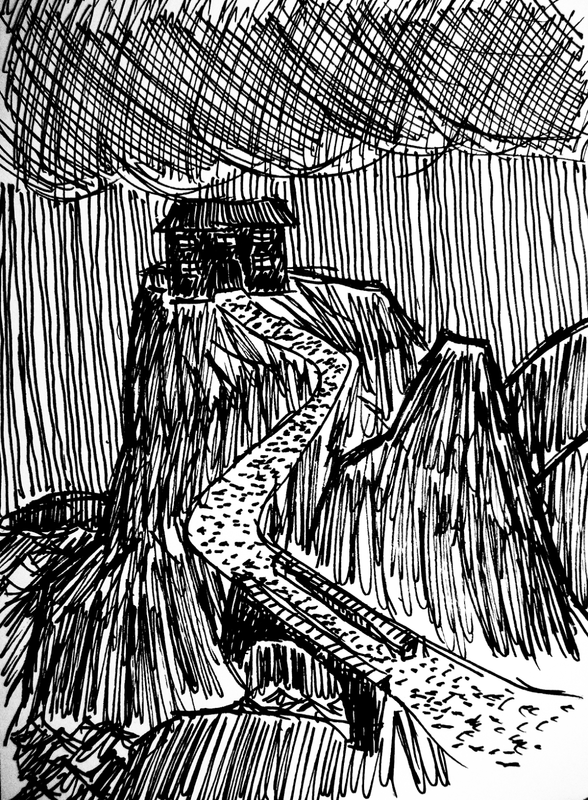 The outlines of the ruins they had spotted previously were visible on a densely wooded mountainside, but Einar decided to wait until the morning. At dawn, a small skiff set out towards the bay at the base of the mountain, with ten hand-picked men and the landing party. The thing they’d spotted was a small sailing boat hidden under the crown of some trees, with fishing nets and a pair of oars. “This could belong to the werewolves. Maybe we should sink it?” came Elandir’s suggestion. The company slowly climbed the narrow trail to the ruined white buildings. On a mountainside plateau, they found the stone foundations of burned and ruined houses, a collapsed longhouse, saplings already growing in the wreckage. “I wonder… There it is!” Jonlar Zilv pointed at a small, slate-roofed building. Smoke curled from a low chimney, the door was open, and nets were hanging on the porch. From the house came a sound, and a great wolf jumped out to bar the entrance, growling and baring its teeth. Jonlar gestured to the men to stay their weapons. Behind the wolf, an old man appeared. He was bearded and fair-haired, wearing a simple garb and an axe on his belt. “You have been very helpful,” Jonlar Zilv bowed. “What about the Gwydions? Do you know them?” blurted Gadur Yir. The others looked at each other, then back. “We have seen them. They had strange customs,” responded Gadur Yir. “We should be leaving,” Jonlar Zilv was eager to end the conversation. The ship sped towards Gont as the good winds carried it. It was already late in the afternoon when they spotted the barren little isle, and dusk by the time they got close to it. Tall rocks rose into rugged outcroppings, and a narrow road wound from a small, abandoned stone pier to a two-story house. There was a bell next to the pier. Large clouds gathered, and the rain began to fall. Once more, they disembarked and climbed the serpentine road. 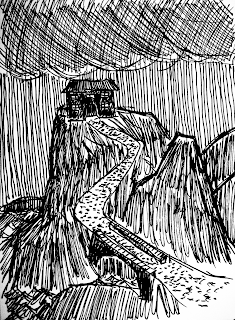 The house was not much of a mansion, but it was secure on top of a bare and uninhabited island, buffeted by strong winds and surrounded by sheer precipices. Window shutters rattled on their hinges, and the gates were slightly ajar. Above, a relief depicted the slender form of a wyvern, flanked by two stars. “Feranolt! This is the place” Jonlar exclaimed. Carefully, they entered the dark building. It was cold inside, and there was a damp smell all around. The chamber, a large sitting room, was a mess. Chairs were thrown here and there, broken bits of wood and smashed items littered the floor. Wind was wailing in a cold fireplace filled with ashes, where books had been burned in a haste. A body was lying in a pool of blood, a grievous wound almost cutting him in half – a lightly armoured guard. The track looked inhuman with three claws, belonging to something that must have been very heavy. They were all around and there was no definite direction except outside and up the stairs. They searched more of the lower floor, finding servants’ quarters, a guest room, and a kitchen with smashed objects and a large, hanging piece of brawn that looked like it had been bitten into two pieces with a single bite. Climbing the stairs revealed another, smaller sitting room with another body, a mostly intact dining room with three sets of dishes prepared for a meal, a terrace overlooking a sheer drop into the dark seas, and finally a drawing room. More papers had been destroyed here, and furniture made of fine wood used to light a fire. A bureau had had its drawers pulled out and the contents smashed and scattered. The efforts paid off, as Jonlar found a secret drawer that had been left unmolested. Withdrawing a package, he found coin rolls packaged in paper – 150 gold in total – and a letter stamped with the seal of a wyvern between two stars. “Could the two stars refer to the head of the family? Or is it an older form of the standard insignia?” asked Harmand. “It is a pity we can’t reproduce that seal. Still.” He threw the crumpled piece of paper on the floor in clear sight, then the pieces of the sealing wax on it. “If we return to Haghill, and ask around for newcomers, we could have our bird. Who knows?” He stamped on the remains to make them dirtier. Down in the ship’s cabin, anchored in a small bay some way off from the pier so Shekou – or the monsters, or anyone else – wouldn’t find them, they studied the large map sheet. 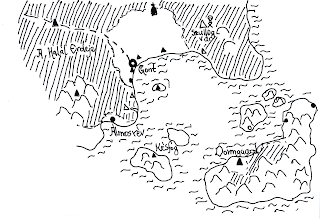 “Look – there is another triangle up in those south-western mountains… and something to the north?” countered Harmand. 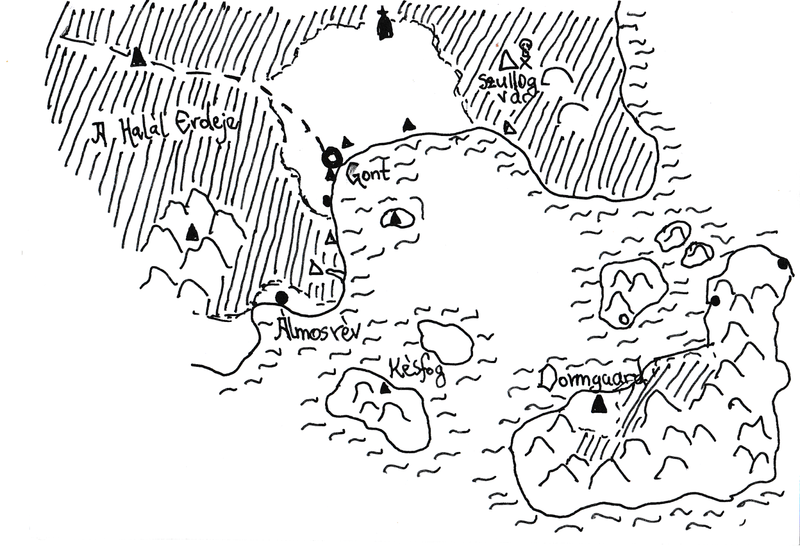 “I think the circles are villages and the triangles are fortifications,” remarked Jonlar. “Or hiding places!” said Gadur Yir. There was no disturbance during the night, and soon, they were sailing again, deciding to avoid Gont for the time, and check out the triangle to their north. Hours passed again as they sailed, until they spotted another group of fishing boats, which fled as soon as they spotted the larger ship. “What do you know... could this have anything to do with the fact that Northman ships may enjoy a bad reputation?” asked Harmand the Reckless. They sailed on, and the white cliffs of the northern shore rose above the sea. Above a harbour, a small fortress stood on the rocks, green and blue pennants flying in the wind. The lookout could make out the sign of two acorns and a star. Weighing their options, they sailed into the harbour, preparing to disembark. (Session date 14 January 2017). Referee’s notes: Somehow, back on track after a large but fruitful detour. The brutal battle with the hags and their sea zombies was one of those confrontations which could have ended very badly, but was won by perseverance, large numbers, a bit of luck... and a bit in the rules I didn’t prepare for. When adapting the hold person spell for my own rules, I did not specify it would only affect human and mostly human opponents – what’s worse (from the GM’s perspective), it is simply translated as “hold”, without the extra meaning of the English original. This way, two targeted hold spells caught two hags, which just happened to turn the tide of the battle. Then, a step towards the Feranolts. The isle dwelling attacked and looted, the map and the message are all that’s left for now. The emerging consensus in the group is to take revenge on Grave-Wight, who seems to enjoy a close connection to the old Feranolt family. 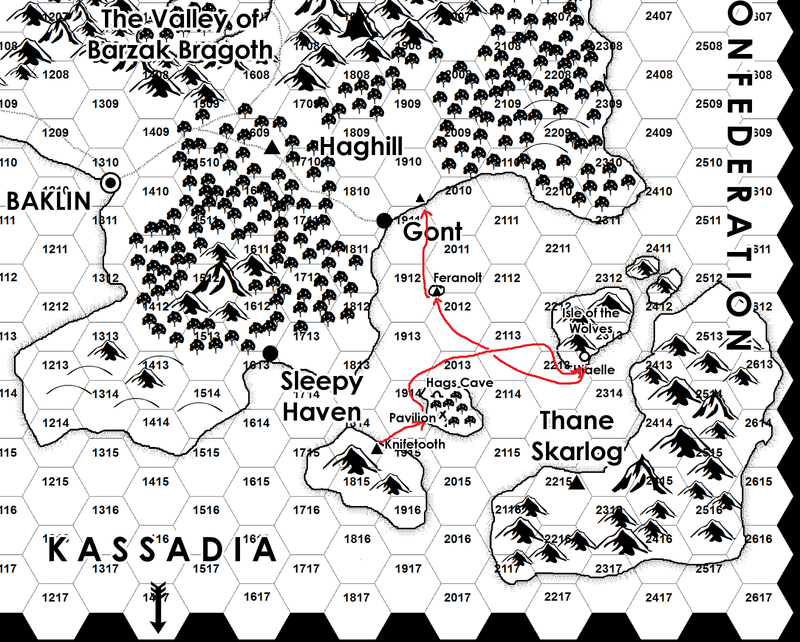 It is a good question whether the Feranolts are still influential, or even extinct – Gadur Yir’s player suspects this is all a misdirection, while Jonlar Zilv’s player believes they have some kind of smuggling or spy network in the area. WRT the sea hags, do your house rules take into account MR?---50% baseline seems like a tough nut to crack for low-level PCs. I'm afraid it was sheer neglect. The adventure notes took into account the MR, but in the heat of action, it slipped my mind. Let's call it a stroke of luck.